Thousands rally for pro-Kremlin Riga mayor probed for graft - SABC News - Breaking news, special reports, world, business, sport coverage of all South African current events. Africa's news leader. People hold up placards which read "Democracy - power of people" at a rally in front of Riga City Hall. Several thousand people rallied in front of Riga City Hall on Saturday in support of Nils Usakovs, the city’s mayor and leader of the popular pro-Kremlin Harmony party, who is under investigation for corruption. Usakovs faces a confidence vote at city hall next Tuesday after a probe into kickbacks on bus and tram contracts for Riga public transport turned up evidence of graft. 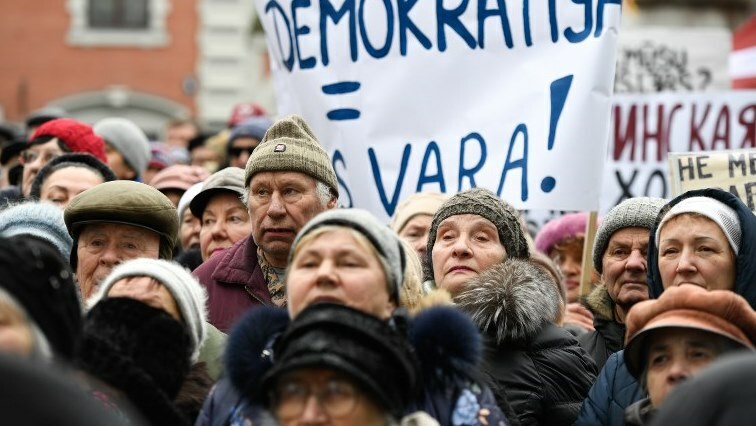 The mostly elderly Russian speaking protesters touted placards saying “Hands off our Mayor Usakovs”, “We’re here for Nils!”, “Don’t touch the Riga City Council”. Usakovs, speaking in Latvian and his native Russian, denied any wrongdoing. At the national level, his popular Harmony party is backed mainly by ethnic Russians who make up about a quarter of Latvia’s population of 1.9 million. It topped October’s general election, but was unable to find a coalition partner among mainly ethnic Latvian parties and has been relegated to the opposition. Usakovs was briefly detained and searched in January in an ongoing corruption probe into bus and tram purchase contracts for city-owned public transportation company Rigas Satiksme. In December six high-profile suspects, including Rigas Satiksme CEO Leons Bemhens and Maris Martinsons, one of the richest businesspeople in Latvia, were arrested in the probe. They remain in pre-trial custody as anti-corruption investigators probe kickback schemes involving tram and bus deliveries from Poland and the Czech Republic to Rigas Satiksme. According to the Polish Anti-Corruption Bureau (CBA), the kickback amount was at least 800,000 euros ($905,000), while TV3 Latvija later reported that bribes accounted for five to seven percent of the deal’s value. Protesters rallying for Usakovs on Saturday appeared to be oblivious to the allegations of graft that have engulfed city hall. “I support Usakovs just because he is Russian, and Vladimir Putin is also Russian,” one elderly protester who asked not be identified told AFP. The gathering was supported by the Latvian Union of Russians, a local Putinist party, but was notably not supported by Honour to Serve Riga, a regional party which forms a majority with Harmony in the 60-seat Riga City Council. This entry was posted on 09 Feb 2019,05:43PM at 5:43 PM and is filed under World, News, Homepage Latest Stories Slider. You can follow any responses to this entry through the RSS 2.0 feed. Both comments and pings are currently closed.